Also known as the "race that almost didn't happen". As I mentioned in this post, I found out about this race when I bumped into a friend of mine at the health expo for Hospital Hill. She was helping a friend run a booth about the race who had lost her husband to colon cancer in October 2011. It was a pretty easy decision to signup for this race. 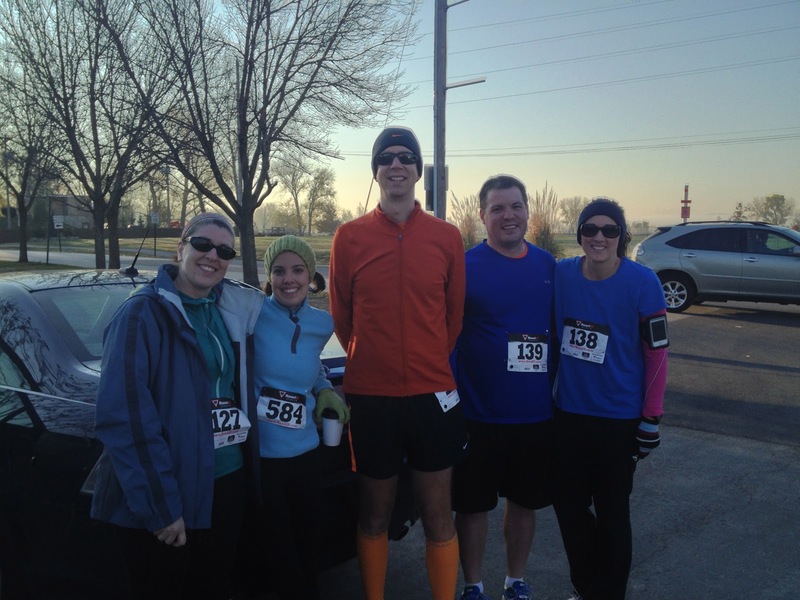 Good friends, good causes, and the race was within running distance of my house. It's literally about 5k away! So if this was such an easy decision, why didn't it almost not happen? Work. I had a project scheduled for implementation on Saturday (the day before the race). We do this project every year but this time it took longer than normal. I started at 3am on Saturday but I got the final "all clear" at 8am on Sunday. One hour before the start! Fortunately I was home and had already changed into my running gear. If this race had been somewhere other than English Landing Park, it would have been a no-go! Whew! I did have a banana and bagel while I was waiting for the "all clear". It did help that this race was at 9am so I would be able to take my time in the morning. Also, I did get a decent night's sleep even though I woke up every few hours to check in on things at work. I decided to dress up as my mobile orange barrel (see the photo at the bottom of this post). With the weather was upper 30s I did elect for a short sleeve orange top and a long sleeve base layer. Normally I would not have worn my new calf sleeves for a 5k but there was talks of Joe VI and me doing a long run after the race. They were nice leg warmers in the meantime. TKB and Morgan had already taken off for the race while I was working. I managed to get down there when my Mom had arrived. So we walked to the coffee shop in Parkville, which is where TKB and Morgan were cooped up to stay warm. This being my Mom's first race, I helped put her timing chip on and TKB helped with pinning her bib to her sweater. It was fun showing my Mom the ropes! We left to go back to TKB's car to drop things off and we met up with Aaron and Jenny (who you may recall ran the Blues and Brew 5k in September) and Lauren. Aaron, Mom, TKB, Morgan, and Jenny. Sorry, I guess we did our photo shoot before Lauren arrived. Boxers! Good thing they weren't brown. We ran into many friends near the start line, including people I knew from high school (Hi Amanda!). With about 5 minutes to start I moseyed up to 'toe the line'. That was a challenge because their were about 20 kids across it. The emcee asked the kids to move to the side so they didn't get run over by the big kids. hehe. This was undoubtedly the smallest race I have participated in, so it was fun to see kids having a good time here. It definitely lightened the atmosphere. I said "Hi" to Dave (Jenny's husband) who was in it to win it. So I lined up behind him and a few other fast looking people. After the national anthem, we took off! Once things got settled after a 1/4 mile, I was probably sitting in 7th or 8th place. I'm not used to being able to see the race leaders for a good portion of the race. The course is on a crushed gravel trail with some areas of pavement near the start/finish line. While I was familiar with the park, I had no clue what the course route would be like. The first mile involved running the first smaller loop so we actually did a big circle and ended up having to run around all the walkers. I would probably complain about this but I actually didn't mind it at all. I preferred the grass than the gravel. I enjoyed running by people I knew and tapping them on the shoulder. hehe. My first mile was 6:19 pace. Waaaaaaay toooooo fast for me. Oh well. I did the first 1/3 of it under 6 minute pace. Oops. Given all that, it felt OK. So now we are on the longer stretch of the trail that sort of U-turns back along the river. It was about this point where I got passed by 2 guys. One looked older than me and one looked way younger. Fine with me! Not in my age group! There was another turn around a circle drive where there was a water stop. I, however, didn't. I kept cruising along. My first 1/3 of a mile of the race caught up with me. Since we had doubled back on the trail, I got to see Aaron, Jenny, and Lauren working their 2nd mile. I had caught up with the younger guy that had passed me earlier and I must have given him the motivation to take off because as soon as we hit that u-turn again, he was gone. I tried to muster all the turnover I could so as to not leave anything on the course. I did see TKB and Morgan, as well as Mom walking with Bob and Nancy (Jenny's parents). As the tunnel vision started to close in on the finish, I heard another person say hi to me and it was the Officer of my department at work. Well, I had to confirm it on Monday at work because I wasn't looking around much at this point. The last 1/10 of the race was on pavement but I seemed to keep slowing down. Mostly because I allowed myself to look back and no one was closing in. No PR for this race anyway. That sub-20 minute 5k will have to wait until next year. Not my best 5k performance of the year (by 21 seconds) but this crushed gravel does slow me down. They had water and chocolate milk waiting for finishers as well as a big bucket of protein bars of various brands and flavors for your taking. I did grab one because of the impending 20 mile run with Joe VI (although, I was definitely questioning it now); however, the pancake brunch and make-your-own mimosas and bloody marys were on the menu next. I waited for Aaron, Jenny, Lauren, TKB, Morgan, and Mom to finish before heading over. Eventually Joe VI came over as Lauren was finishing and we decided to nix the run from Parkville to Roeland Park with a potential run later in the day. 1st Place in Age Group! Woo hoo! According to the official results, I was 9th overall as well. Apparently I didn't get the blue memo. 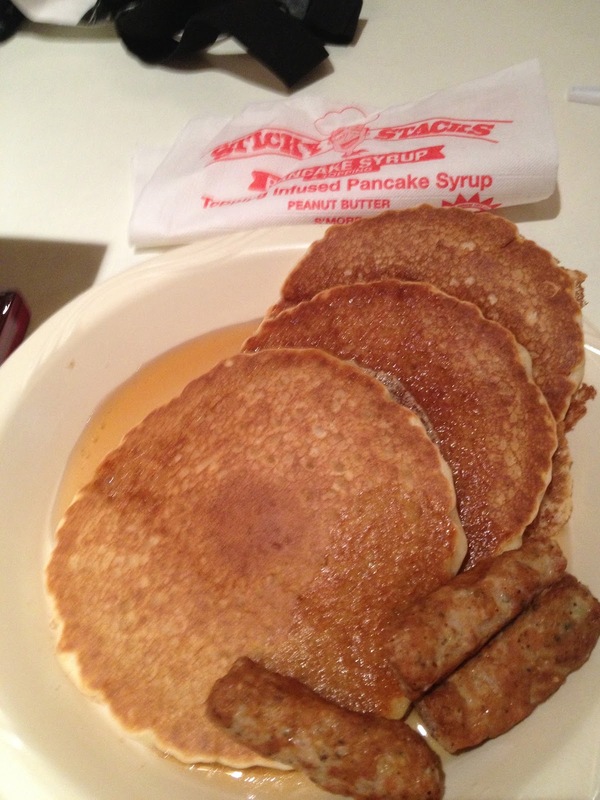 Pancakes and Sausages from Chris Cakes. So good. 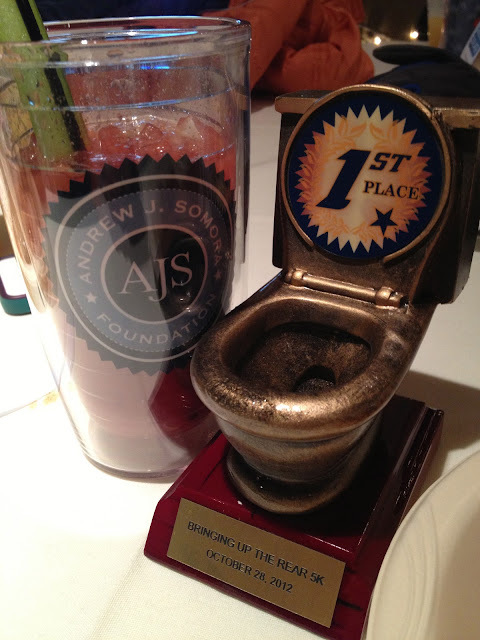 My 1st Place Trophy! And Bloody Mary! Mom, Nancy, and Bob flying into the finish line!